Generate and Analyze Multi-Level Data Spatial microsimulation involves the generation, analysis, and modeling of individual-level data allocated to geographical zones. 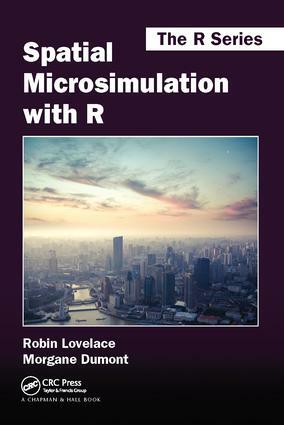 Spatial Microsimulation with R is the first practical book to illustrate this approach in a modern statistical programming language. Get Insight into Complex BehaviorsThe book progresses from the principles underlying population synthesis toward more complex issues such as household allocation and using the results of spatial microsimulation for agent-based modeling. This equips you with the skills needed to apply the techniques to real-world situations. The book demonstrates methods for population synthesis by combining individual and geographically aggregated datasets using the recent R packages ipfp and mipfp. This approach represents the "best of both worlds" in terms of spatial resolution and person-level detail, overcoming issues of data confidentiality and reproducibility. Implement the Methods on Your Own DataFull of reproducible examples using code and data, the book is suitable for students and applied researchers in health, economics, transport, geography, and other fields that require individual-level data allocated to small geographic zones. By explaining how to use tools for modeling phenomena that vary over space, the book enhances your knowledge of complex systems and empowers you to provide evidence-based policy guidance.